This species was split into three in 2004. 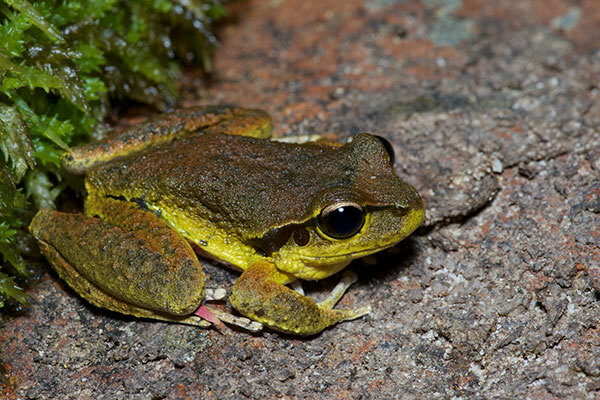 Litoria lesueuri was redefined to include only the frogs from the southeast coast, more or less from Sydney down. The frogs north of this formerly included in L. lesueuri were placed into Litoria wilcoxi or Litoria jungguy. Some time later, all of these species were transferred to the genus Ranoidea. It's tough to keep up with all of these changes! This Stony Creek Frog was at the stony edge of a creek, so bully for it. Only adult calling males have yellow on the limbs and sides like this one.